A form of propulsion for spacecraft; a sheet of lightweight material reflects light from the sun or other light source. 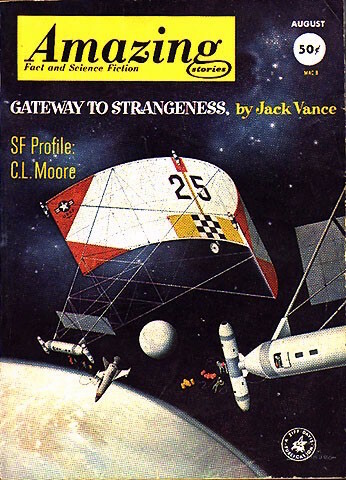 An early use of this term in science fiction is in Jack Vance's Sail 25, with the marvelous character Henry Belt, an experienced spacer who is the captain of a small training craft called Sail 25. The propulsion for this craft comes from light pressure (also called radiation pressure) from the sun upon this sail made of extremely lightweight material. The story is about a training cruise, in which six cadets are taken on a simple little training cruise to Mars. From Sail 25, by Jack Vance. This is a classic story; unfortunately, it is mostly available in out-of-print collections. The very first science fiction story about solar sails was probably "The Lady Who Sailed The Soul" (1960) by Cordwainer Smith. The story takes place thousands of years in the future - "Out of it all, two things stood forth - their love and the image of the great sails, tissue-metal wings with which the bodies of people finally fluttered out among the stars." In 1958, NASA launched Echo 1, the first U.S. passive communications satellite. It was an aluminum-coated Mylar plastic balloon (microwaves bounced off it). Echo 1 is the first time NASA included solar pressure in calculating trajectory. Once in orbit, solar pressure moved the "sateloon" but didn't collapse it. Apparently, some projects have already been tried to attempt to prove the real-world feasibility of light sails. Reflective panels may be used to slowly steer spacecraft, conserving fuel better used for maneuvering. A similar sort of scheme involves using lasers to push on a solar sail, thus powering a ship from a distance; see laser cannon, from Mote in God's Eye by Larry Niven and Jerry Pournelle. - Ikaros Solar Sail Works!